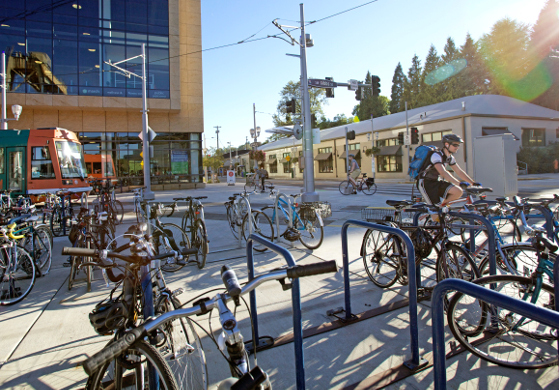 The Oregon Health and Science University bike valet in Portland. Photo: Zachary Kaufman. In the business world, it’s called “first mover advantage.” It’s the head start Apple got in the smartphone market because it invented the device. The more we learn about young Americans’ priorities in where they want to live, the more it’s looking like a few cities that happened to start investing in low-car transportation options years ago have been enjoying a big head start in attracting young workers over the last 10 years, even if their local job markets are ho-hum at best. It’s old news by now that young Americans are far more enthusiastic about urban life than their parents were. But a 10-city survey released this week shows something interesting and new: this attitude seems to be nearly as common among young people in Indianapolis or Tampa as it is among those in New York or San Francisco. In the international battle for human capital, this is pretty interesting news. The same poll found that 54 percent of young adults surveyed “would consider moving to another city if it had more and better options for how to get around, including public transportation, car- and bike-sharing, and pedestrian-friendly streets.” This finding, too, was almost identical across the three city categories. And it looks as if it reflects exactly what’s been happening. Here are two lists, from a 2012 academic paper, of the cities attracting and retaining the biggest share of migrants with college degrees in recent years. In summary: you can get educated young people to move to your city by being flush with jobs (Austin, DC, San Jose) or you can get them by being cheap (San Antonio, Pittsburgh, Louisville). But for cities that fall into neither category — Portland and Charlotte jump out in particular — there are other forces at play. The question for Portland and Charlotte, then: with cities across the country catching on to the factors driving young folks’ migration patterns, how much longer will this economic edge last?